Recycle Your Water Bottle… In the Toilet? 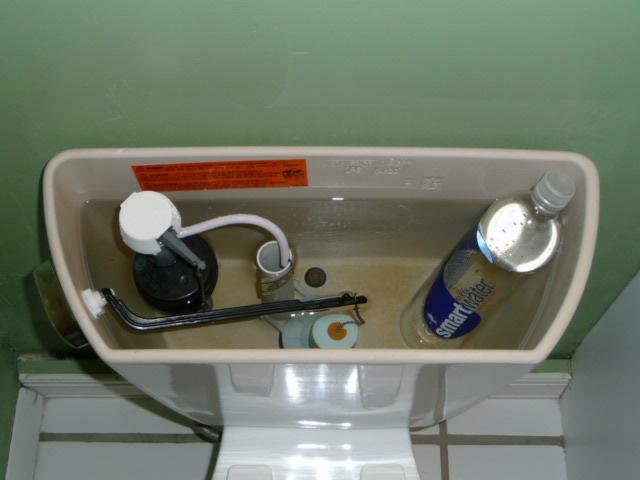 One of the most simple tips I have received to become a more “green” citizen, is to recycle a water bottle in the tank of your toilet. This simple step will turn your boring and outdated John into a fabulous and earth conscious, low flow toilet. Of course, if you would like to save even more money on your water bill, you can also place a half-gallon jug in the tank. However, proceed with caution. If you displace too much water, your toilet will most likely clog more often, if you are the type of person who flushes an entire tree of toilet paper down the drain. Hint: Sometimes less is more folks! The reason this simple step will make such a difference is because toilets are the largest consumer of water in the entire household. Americans flush a whopping 4.8 billion gallons of water down the toilet, every day. (1) It is easy to see how such a small change will make a large difference very quickly. The installation is quite simple, and I will outline the steps below. 1. Finish drinking that delicious spring water from your water bottle and then remove the label. You don’t want soggy pieces of paper floating around in there! 2. Fill the water bottle halfway with pebbles or sand and the rest with water. Then, twist the cap back on. The reason you fill the water bottle with sand is because you don’t want it sliding around in there, causing a raucous. 3. Place the water bottle in the tank gently, and away from moving parts. 4. Place the lid back on the tank and voila! You have created an instant upgrade for the environment and to your pocket-book! Please do the environment, yourself, and thirsty people everywhere a favor, and either recycle that water bottle in your toilet, or use that tax refund to buy a shiny new low flow toilet! If you try out this fantastic tip, please comment on how much it saved you on your water bill and if it is as easy to do as I claim!